In the past few weeks, I had the opportunity to travel up and down California’s west coast, enjoying the spring wildflowers and the clear skies over the oceans. 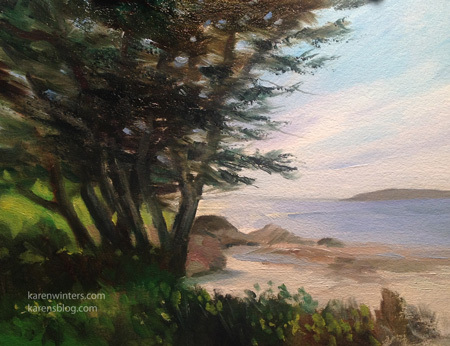 One of my favorite painting spots is Asilomar, near Pacific Grove, on the Monterey Peninsula. My little Strada mini easel set up so quickly I was painting in no time. 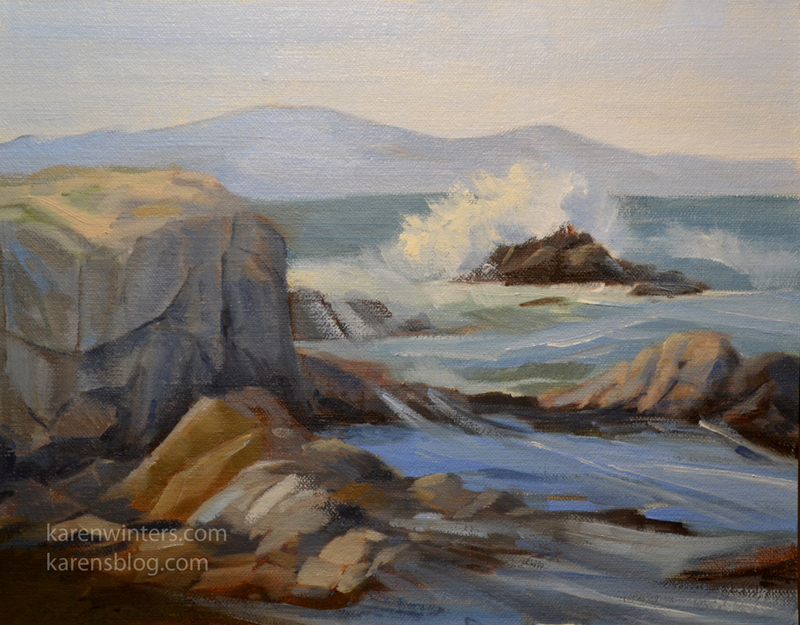 Whenever I paint ocean scenes, it takes more time to get into the rhythm of the scene. With other landscapes there’s little movement except for perhaps cloud shadows. The ocean is a whole different challenge and its dynamic nature takes more concentration. It was a quiet day when we were on the Monterey Peninsula. There was a slight mist in the air which softened some of the colors. The waters of Carmel Bay truly reflected the word “Pacific” – peaceful. 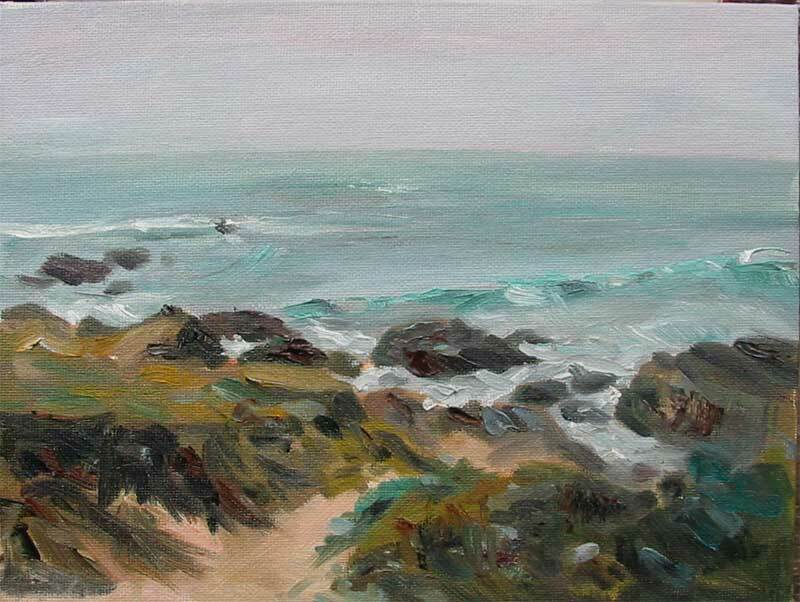 This view of Carmel Bay looks slightly to the south and Point Lobos, where I have painted before. 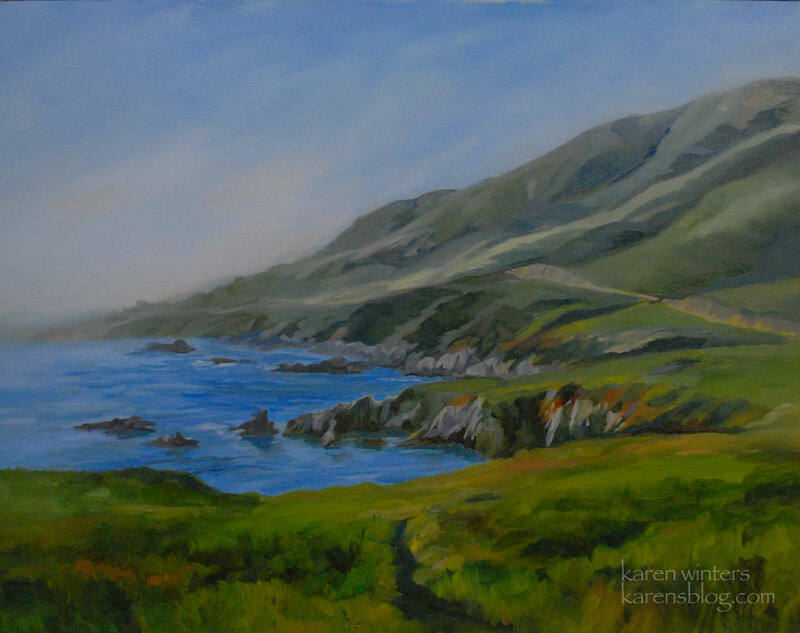 On our way back from the San Luis Obispo Plein Air Festival this year, we drove up highway 1 through Big Sur, spent a night in Carmel, then returned via Carmel Valley Road. This beautiful “back road” features wonderful hills covered with oaks. The day we passed through, the clouds were spectacular, so I decided to focus on them in this painting. 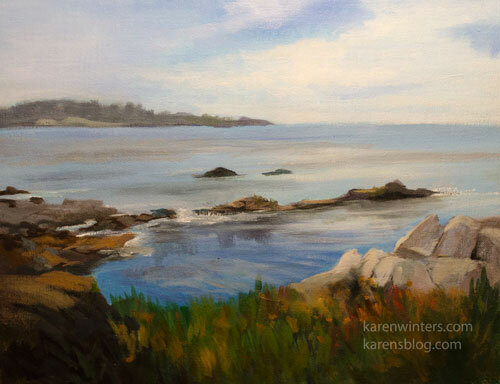 If you look to the left side of the blog, you’ll see I’ve gotten around to updating my sold painting list. 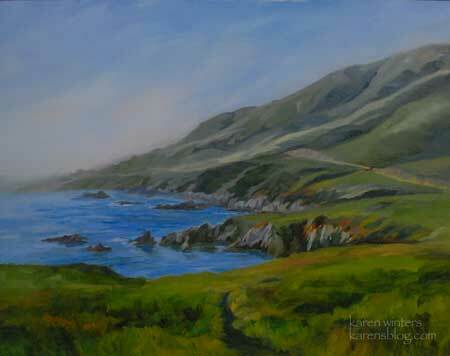 I haven’t put my new sold paintings there since January, and this year’s almost 50 sold works are now featured. I sort of wish that I could see a pattern in what appeals to my wonderful collectors, but it appears that their tastes and interests are as broad as mine. Some paintings are large, some very small. 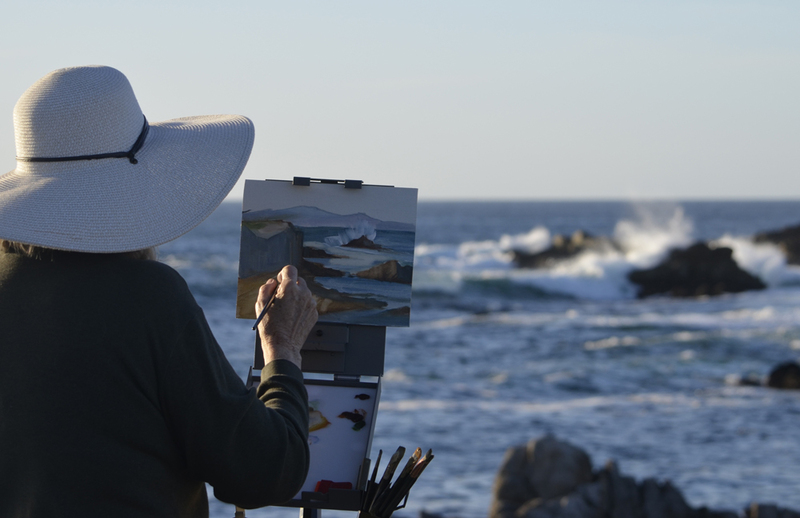 There are seascapes, animals, genre paintings, flowers, fruit, landscapes … and the subject matter is from every part of California. The state park on a beautiful clear day with just a little mist hovering over the distant headlands. A look so typical of the area. I’ll bet that this location has been the scene of many marriage proposals, it’s so beautiful. 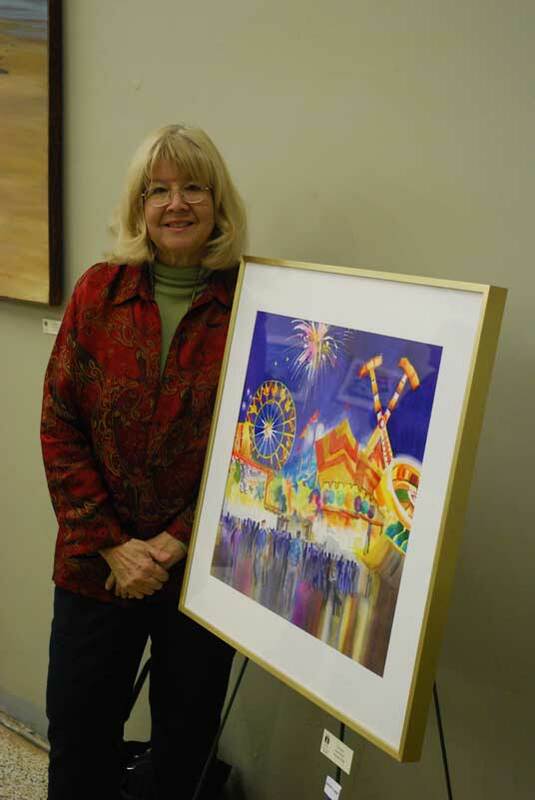 Last weekend, I attended the artists’ reception for the Pasadena Society of Artists ACE Exhibition, and was delighted to learn that my painting of the LA County Fair, “Fun Zone,” had won an Award of Merit. 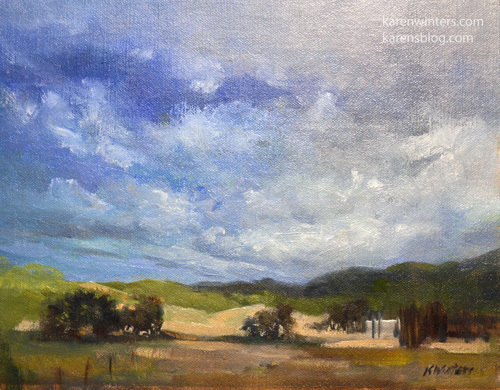 This has been a really exciting week for me – first learning that I am a new Artist Member of the California Art Club, and now this honor from PSA. I can hardly wait to find out what surprises this new week will bring.